Easy, decadent and perfect for Valentine’s Day. This triple chocolate tart has a chocolate cookie crust, a truffle-like interior and a silky ganache topping. 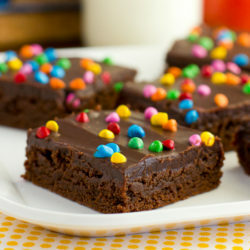 Ok all of you chocolate lovers out there, this recipe is for YOU! For Valentine’s this year I wanted to make my husband something extra special, a chocolate dessert that he would absolutely love. He’s always been a little iffy about cookie crusts (he prefers chocolate pie crust) but after promising to make it thick and buttery, he gave me the go-ahead. The result: two thumbs up! 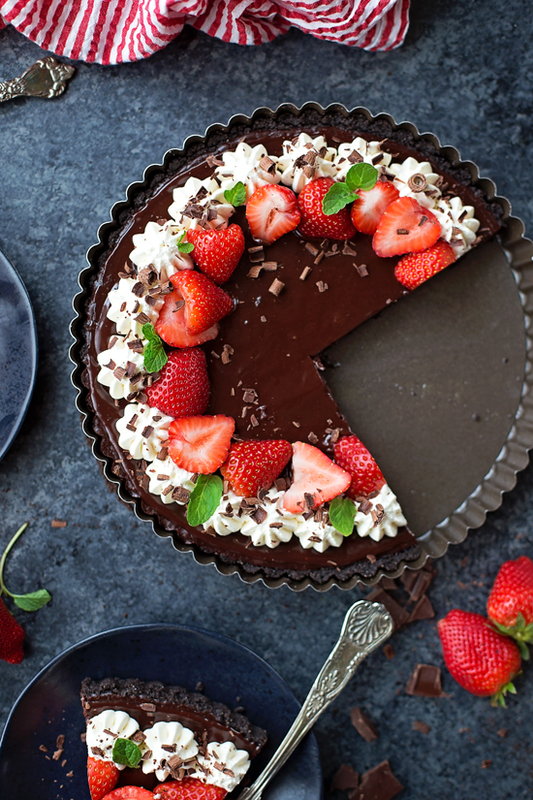 This triple chocolate tart is a lot easier than it looks. The crust is three simple ingredients, the filling comes together in minutes, and the ganache topping is a breeze. After a nice little rest in the fridge, it’s ready to go! 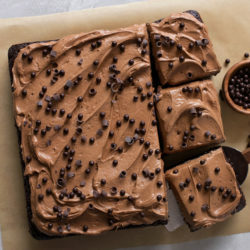 Let’s talk about what you need to make this decadent treat. For the crust, grab some Oreo cookies or chocolate graham crackers. You’ll need about a cup of crumbs. 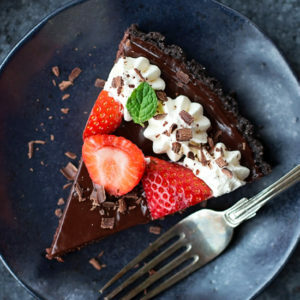 The filling and the crust call for a whole lot of bittersweet chocolate. Please, please, please use quality chocolate!! I absolutely love the selection of gourmet chocolates from Harmons Grocery. I picked up a few bars of dark chocolate, some of them with little bits of dried red berries or fruity notes. 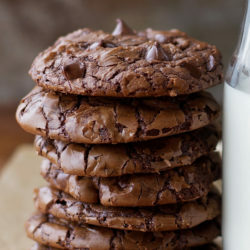 The chocolate you use makes a HUGE difference. Tempering the eggs for the filling is probably the trickiest part of this recipe. It’s something I do often, especially for ice cream bases. Here’s my advice: go extremely slow and whisk like crazy! You do not want to scramble those eggs! Pour the filling into the baked crust, and return to the oven until set, about 25-30 minutes. The top will be slightly cracked, that’s ok. I promise it still tastes amazing! When the tart has almost cooled, make the ganache and pour it over top. Use an offset spatula to spread it into an even layer. Pop the tart in the refrigerator for an hour or so to let it fully set. 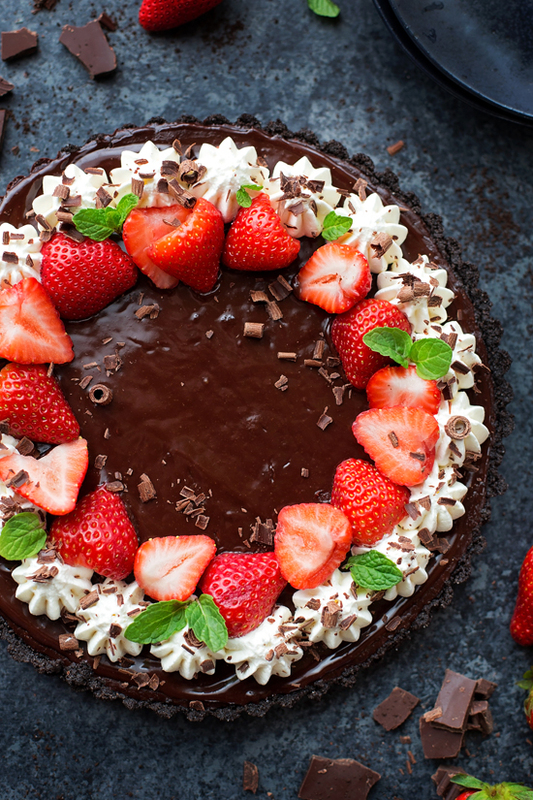 When you’re ready to serve it, garnish it with freshly whipped cream, sliced strawberries, chocolate curls and a few mint leaves. 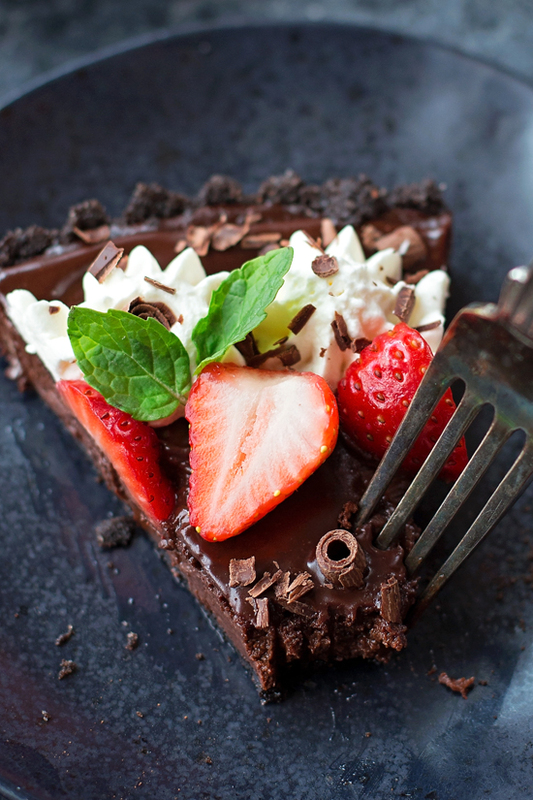 This dark chocolate dessert is for extreme chocolate lovers only! It’s thick, rich and absolutely dreamy. It definitely got the stamp of approval at our house! Easy, decadent and perfect for Valentine's Day. 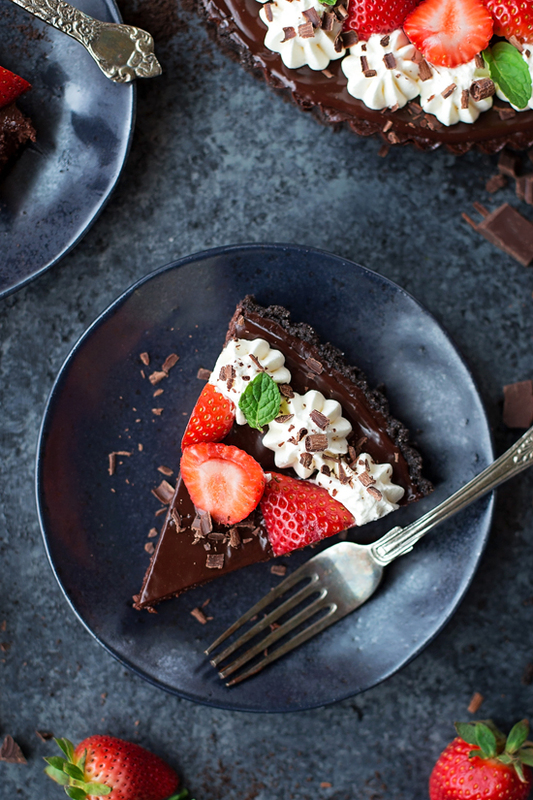 This triple chocolate tart has a chocolate cookie crust, a truffle-like interior and a silky ganache topping. In a medium mixing bowl, combine cookie crumbs, sugar and butter. Press onto the bottom and ¾ of the way up the side of tart pan. Place in the oven and bake for 10 minutes. Remove from the oven and allow to cool while preparing the rest of the tart. To make the filling, in a medium size saucepan placed over medium heat, add the heavy cream and whole milk. Heat until the mixture boils, then remove from the heat and stir in the chocolate until the mixture becomes smooth. In a medium size mixing bowl whisk the eggs together. Slowly pour about ¼ of the mixture into the eggs, whisking vigorously to combine (and to prevent the eggs from scrambling). This will temper the eggs. Slowly pour the mixture back into the pan, whisking to combine. Pour the filling into the crust and place in the oven for 25-30 minutes or until set. Remove from the oven and allow to cool for 45 minutes. To make the topping, in a small saucepan set over medium heat, bring the cream to a boil, then remove from the heat. Whisk in the chocolate until smooth. Whisk in the corn syrup and water. 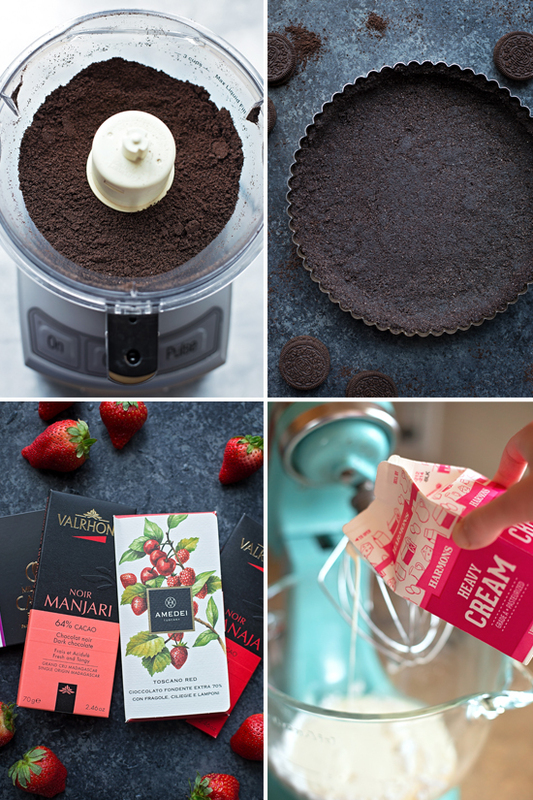 Pour over the tart, then spread in an even, smooth layer. Place in the refrigerator to set for 1 hour. 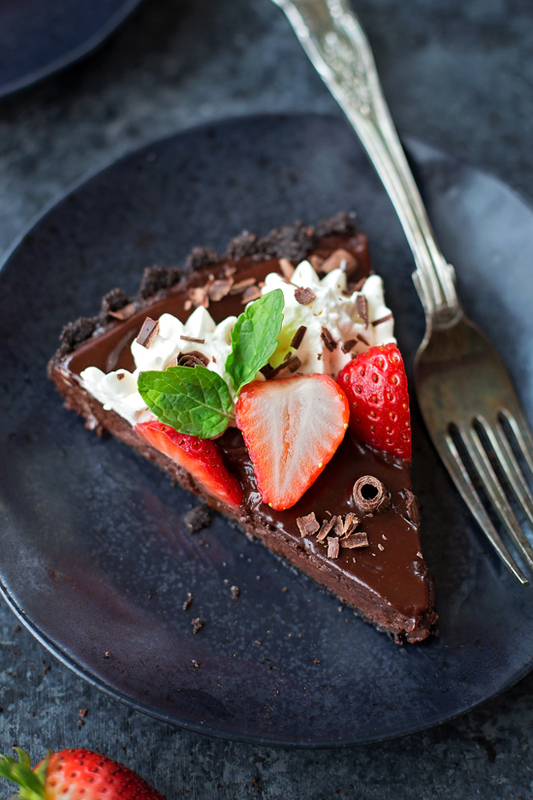 Garnish with freshly whipped cream, chocolate curls, sliced strawberries and fresh mint, if desired. *Anywhere from 60% to 75%. If you prefer something a little less dark, you can always swap out it out for semisweet or a dark milk. -You can add ¼ - ½ teaspoon of espresso powder to the water in the glaze. hey girl- this tart looks amazing!